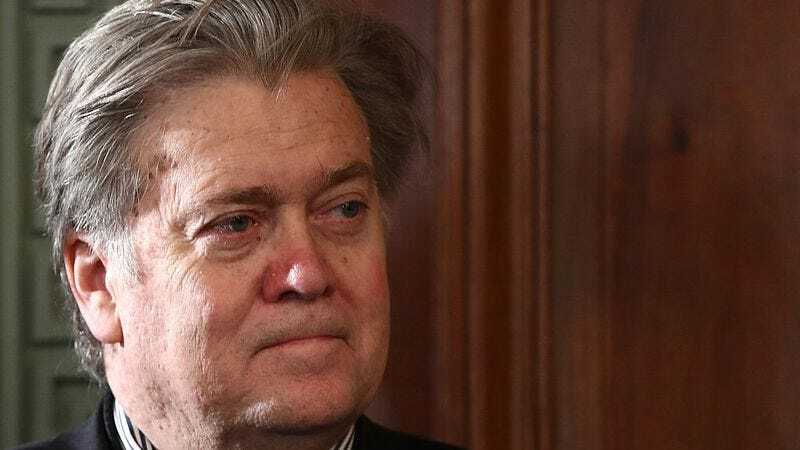 Steve Bannon—the racist, Darth Vader-worshipping, ferociously anti-Muslim opportunist whom President Trump has accidentally made one of the most powerful people on the planet—is being scrutinized as the cause behind Trump’s disastrous first two weeks in office. Yesterday, The New York Times reported that Trump was not even fully briefed on the fact that he had placed Bannon on the National Security Council, a position normally held by generals and kept entirely free of politics. He was the mastermind behind the botched rollout of the Muslim Ban, and he’s reportedly already drafted many more additional executive orders that he wants Donald Trump to give a cursory glance to before signing. The scrutiny on Bannon is well-deserved, in other words; he is the most trusted advisor to our easily swayed, know-nothing president. Bannon’s rich past has already been picked over amply since his emergence last year: He has alternately served as chief race-baiter at Breitbart, documentarian filmmaker, and sometime Hollywood fringe figure who made millions off of Seinfeld. Today, however, we turn our eyes upon his abortive attempt to create a rap musical based on Shakespeare’s Coriolanus. “South Central is the belly, you, niggas, its mutinous members; look on and you’ll see that the benefits which you receive proceed… from them to you. In no way from your sorry black asses,” Agrippa retorts. In the interview, Bannon’s old writing partner says he wasn’t racist at all—citing at least one (1) black friend—and indeed, the invitation to the staged reading of The Thing I Am evokes some of the very issues his administration seems opposed to. Would Bannon’s attempt to evoke the Los Angeles riots via rapping achieve the same fusion between verse and narrative Prince Paul did on his epochal A Prince Among Thieves? Or would it, perhaps more likely, sound more like Saved By The Bell’s “Snow White And The Seven Dorks”? He is the most powerful person in the country. Failed artists can do terrible things.